I first blog about Som’s when it created a buzz in Rockwell area around October of 2005 (Som’s Noodle House – cheap authentic version of SukhoThai). Ever since then our verdict was the thai food comes close to Sukho Thai except the Pad Thai. Also, after our first trip to Som’s in Rockwell, we never went back because the mosquitoes and flies were annoying us. Their full pledge restaurant along N. Garcia is still down to earth and serves the same quality of food. I liked their idea of having a living/dining room area with TV that you can rent for P100/ hour. It was perfect for us especially since we have kids and we are a big group of 8. Also, this is good if you want to watch a much awaited telenovela with your officemates or simply watching NBA with your friends. Overall, Som’s is highly recommended for the Sukho-Thai taste of Thai Food except for the Pad Thai. Inside we were surprised that Som’s was a spacious and can accommodate 50+ people. I liked the simple down to earth interior — nothing fancy but you would feel at home and at ease. Thai Ice Tea (P30+). Aidan did not waste any time to consume one of favorite Thai Iced Tea. Tom Yam (P135+). It looked super spicy but when you taste it, even Aidan could take the chili levels of this soup. We loved this and this is how we like our Tom Yam Kung. Bagoong Rice (P95+). This is home-made bagoong rice and it resembles that of Sukho Thai except that the presentation was toned down. Green Curry (P102+). We love the curry!! It is rich, spicy, and I can still taste the yumminess of this dish. I can’t wait to go back to Som’s. Pad Thai (P102+). This is always a disappointment. It seems they got it from those ready made, do it yourself pad thai products. This is along the same road as St. Andrew’s Church and the closed down Cafe Maestro. Have you gone to the original Soms? Prices at the one you went to look a bit higher. But then they have to pay for ac! I’ve been to this branch a couple of times. If the prices are higher, I didn’t notice it. My friend had a bad experience there with the Pad Thai, but judging from the picture, they’ve improved it. Hi… I’ve been to Som’s in N. Garcia. The food is really ok but just a warning to you guys, we got held up there. So in case you really want to go there, DO NOT BRING ANYTHING. Just bring money to pay for your food. Hmm…have had better pad thai locally. Jatujak at MOA, for one. Muang Thai in QC for another. Am actually headed for BKK July 4-11 so will have my fill of pad thai and other yummy treats there! wow! looks nice! although i didn;t quite like the pad thai that i got from their original branch.. Have you tried Thai Pad? It’s along Chino Roces. it’s owned by the original owners of Sukho Thai. they closed Sukho Thai because of the high rental fees in the malls. Food quality is the same as the original Sukho Thai although the menu selection is a bit limited. i recently went back to Som’s near Rockwell. their service has improved a lot. we were surprised that the food was served in 15 mins, before umabot kami ng 40mins noh! i still crave for their tom yum. i know that there are better options out there. but for people like me who are allergic to shrimp, at least Som’s offers the option of beef, chicken Tom Yum variants. I heard of Som’s from Lori and she doesn’t recommend it at all! Sukho Thai is still on top of my list. You should try Blue Ginger in Greenbelt 4 or Banana Leaf. I think theirs is a lot better. I admire you for trying Som’s out. The Pad Thai was a treat, i loved the taste and I liked the smell of the food they have in SOM’s. It had a spicy-smelling scent that made me hungry. Hi there. Using the phrase “full pledged” is wrong. Using the phrase “full pledge” is even more wrong. 🙂 That’s because the correct phrase is “full fledged”. SOM’s offers a variation of curry recipies depending on the level of spiciness that you can handle. Among the choices are yellow, red and green curry that are available to suit ones piquancy craving. Jatujak in mall of asia tastes great too. the prices are reasonable and the servings are generous. 🙂 you should try it. i think there’s a thread about it somewhere here…. I like the food at Som’s but they really should improve the service. I seriously think its a case of over expansion wherein they don’t have the kitchen and staff size to cope up with the increased capacity. The last two times I went there we ended up waiting 45 minutes for the food. i’m happy to hear that you didn’t get any bad service in your visit. guess they realized they needed to improve. good for them! my friends and i used to dine frequently at the one in rockwell, tolerating the not-so-good service until it got worse and worse til down to its worst. the tipping point was when their drunk waiter/server made our friend wait for his order for 45 minutes, only to find out (from a sober server) that his order is unavailable. amidst all of this, the drunk server kept announcing the wrong dish name whenever he served food on the table, like he was just making names and ingredients up. totally weird and creeped us out. Wow lasing na waiter, just like my boyfriend who is also an alcoholic. Your comments and views are very important to me but I will not tolerate such language as this blog is a wholesome medium that caters to everyone and all. I will delete or edit comments that are not appropriate to be posted on this blog. I do hope you respect this blog. You are very much welcome to share your point of view. Talking about Thai food. Check out Thai pad restaurant near Makati cinema square. i cant remember the street but if you see a shell station near mile long the building is on the right if im not mistaken, Marvin Plaza is the name. i love the food there! i think its the best thai hole in the wall . the taste of their thai ice tea is the same as the one I tried in Los angeles. The food tastes authentic and cheap prices! 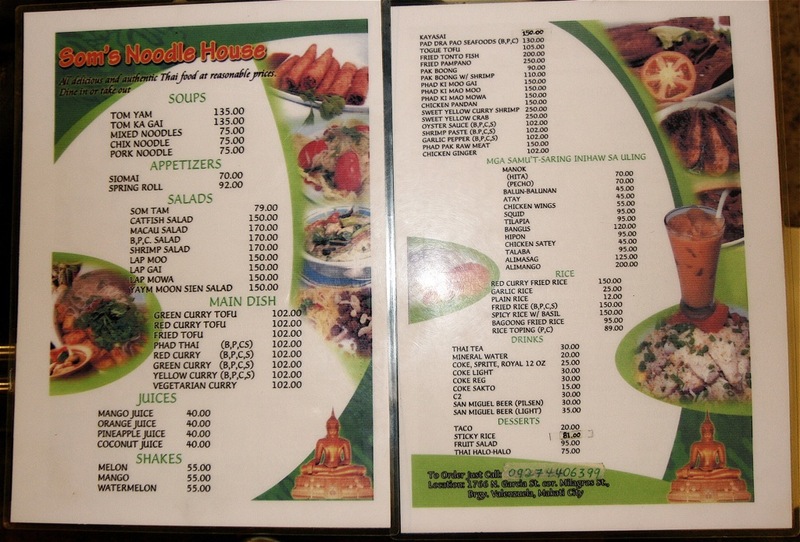 There’s a Som’s Noodle house here in Mandaluyong and its along the Mandaluyong City Hall, Maysilo St., just go around the rotonda and you will see it. The place is nice, parking for around 6 cars, airconditioned but a little bit more pricey. Im not sure if their cooking is as good as the others because i have only ordered the pad thai and it is semi sweet but somehow good and lots of toppings. I’ll post the price list here and hopefully people would give comments regarding this place. Thanks! the fence on the side of Ateneo.